Now more than ever, nuts are recommended as the ideal snack. They are known for being high in fiber, protein, healthy fats, and a variety of vitamins and minerals, much more nutritious than a bowl of potato chips, and—if eaten in moderation—can help you lose weight. Eating nuts also improve heart health and have been shown to lower cholesterol. But not every nut is the same when it comes to its nutritional breakdown, so it is important to know how many are in a serving. This easy comparison chart shows how common nuts differ in nutritional content, making it simple to choose the nut that is right for you. This chart lists the approximate nutritional content in weight (per one ounce) for each type of nut, as well as the approximate number of nuts per ounce. You can compare the number of calories, fat (total, saturated, monounsaturated, polyunsaturated), carbohydrates, and fiber among nine varieties of nuts. One mistake people make when eating nuts is eating too many—the idea is that they are healthy, can help you lose weight, and are much better than other snack alternatives, so there's no harm in grabbing a bowlful, right? Wrong. Nuts are calorie dense, meaning they have more calories per ounce than many other foods (like pasta, for example), causing you to gain weight quickly. So it is important that you stick to the serving size, which is commonly a "handful" or roughly a 1/4 cup. You also want to be careful what type of nut you choose, as some contain significantly more calories per nut. Macadamia nuts, for example, have the highest calorie count, and with only 11 weighing in at one ounce, you aren't getting much bang for your buck. 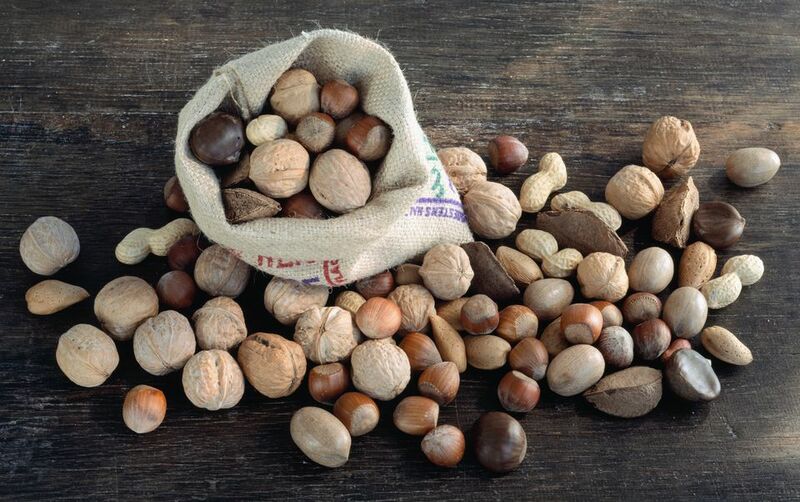 Another thing to keep in mind is that nuts can do a number on your digestive system if you eat too many. Certain compounds found in nuts (phytates and tannins) cause bloating and gas and make nuts difficult to digest, and the high-fat content can cause diarrhea. So measure out those servings!